[S419] Carol Laun, Beneath These Stones, Page 115. Hannah Terry was born in 1777. She married Orator H. Holcombe, son of Reuben Holcombe and Susanna Hayes. Hannah Terry died on 8 May 1848. 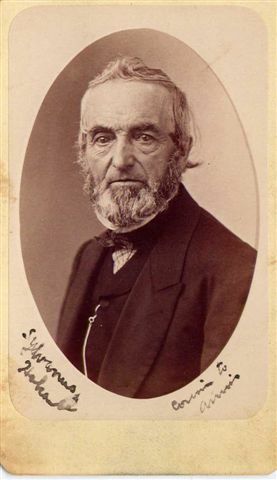 George F. Holcombe was born on 5 June 1798 at Sangerfield, Oneida Co., NY. He was the son of Orator H. Holcombe and Hannah Terry. George F. Holcombe married Buelah Hostingting in 1819. George F. Holcombe married Caroline A. Hibbard in 1837 at Newstead, Erie Co., NY. George F. Holcombe died on 26 October 1878 at Sycamore, DeKalb Co., IL, at age 80. He was buried at Elmwood Cemetery, Sycamore, DeKalb Co., IL. Settled on land given him by his father; moved to Darien and then to Attica; later settled on a farm in Newstead, Erie Co., NY; in 1843, they sold out and moved to Illinois, making an overland journey to Buffalo, and there embarked--team and all--on a steamer for Chicago; settled DeKalb Co., Ill in 1848, purchasing land in Sections 34 and 35 of Sycamore Township. Recorded in the 1850, 1860, 1870 Sycamore, Dekalb Co., IL censuses as a farmer. [S23] Jesse Seaver, The Holcomb(e) Genealogy, Page 91. [S25] Hannah McPherson, Holcombe Genealogy, Page 129.1/Item A-8-1-2-6-10. Harriet Holcombe was born on 4 May 1801 at Sangerfield, Oneida Co., NY. She was the daughter of Orator H. Holcombe and Hannah Terry. Sylvanus Holcombe was Universalist. He was born on 23 March 1803 at Sangerfield, Oneida Co., NY. He was the son of Orator H. Holcombe and Hannah Terry. Sylvanus Holcombe married Julia B. Joslyn on 4 October 1826 at Darien, Genesee Co., NY. Sylvanus Holcombe married Betsey C. Adams on 1 January 1866. Sylvanus Holcombe died on 18 January 1896 at Sycamore, DeKalb Co., IL, at age 92. He was buried on 20 January 1896 at Elmwood Cemetery, Sycamore, DeKalb Co., IL. In 1839 Sylvanus drove with his own team to Buffalo, from Sangerfield, NY; he then embarked for Toledo, from there drove to Dekalb, IL, where he was one of the early pioneers; bought a tract of land in Section 34, Sycamore Township and build a small log cabin where his neighbors were the deer and the wolves which were plentiful; crops failed in 1840 and caused much suffering. He retained that land until 1863 at which time he sold and moved to Sycamore, IL, where he was Justice of the Peace and Town Clerk for nineteen years resigning on his 80th birthday. He wrote much of historical interest in his old age. In 1840 the Town of Sycamore had twelve buildings and a Court House. One of the buildings was owned by Sylvanus. A Congregational Church was organized with eleven members and held services in the Court House. Another building was a shoe shop and another a type of rooming house. Sylvanus and Julia B. were enumerated in the 1850 Sycamore, Dekalb Co., IL, federal census. He was a farmer, age 47, she was 46. Children in the household were Mary 22, Albert 21, Milo 19, Cordelia 16, Laura 14, Oscar 13, and Flora 5. Sylvanus and Julia were enumerated in the 1860 Sycamore, Dekalb Co., IL, federal census. He was a farmer age 57, she was 54. Children in the household were Oscar 22, Martha 26, and Flora 14. Sylvanus and Betsey were enumerated in the 1870 Sycamore, DeKalb Co., IL, federal census. He was a Justice of the Peace, age 67, she was 57. Children in the household were Oscar 32, Cordelia M. 35, Flora A. Calkins 24, and her son Burton M. Calkins 1. [S23] Jesse Seaver, The Holcomb(e) Genealogy, Page 92. [S80] William N. Frey, Holcomb Family in Sycamore, DeKalb County, Illinois. Julia B. Joslyn was born in 1804 at NY. She married Sylvanus Holcombe, son of Orator H. Holcombe and Hannah Terry, on 4 October 1826 at Darien, Genesee Co., NY. Julia B. Joslyn died on 20 December 1864 at Sycamore, DeKalb Co., IL. She was buried on 21 December 1864 at Elmwood Cemetery, Sycamore, DeKalb Co., IL. Betsey C. Adams was born on 10 August 1812 at Cayuga Co., NY. She married Sylvanus Holcombe, son of Orator H. Holcombe and Hannah Terry, on 1 January 1866. Betsey C. Adams died on 27 December 1882 at age 70. John Holcombe was born on 17 May 1805 at Attica, Wyoming Co., NY. He was the son of Orator H. Holcombe and Hannah Terry. John Holcombe died in 1844. Louisa Stone was born in 1810 at Pollet Co., VT. She was the daughter of Hiram Stone and Ann Long. Louisa Stone married Fleming Holcombe, son of Orator H. Holcombe and Hannah Terry.1 Louisa Stone died on 18 April 1886 at Sycamore, DeKalb Co., IL. She was buried at Elmwood Cemetery, Sycamore, DeKalb Co., IL. [S25] Hannah McPherson, Holcombe Genealogy, Page 130.1. 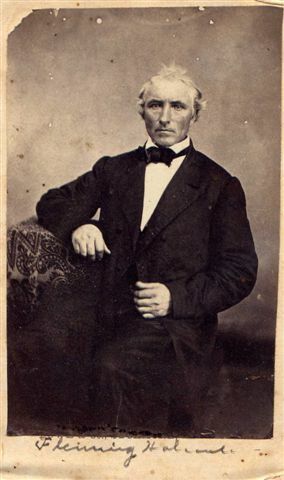 Nathan Holcombe was born on 28 May 1807 at Sangerfield, Oneida Co., NY. He was the son of Orator H. Holcombe and Hannah Terry. Nathan Holcombe died in 1821. Fleming Holcombe was Universalist. He was born on 16 November 1809 at Attica, Wyoming Co., NY. He was the son of Orator H. Holcombe and Hannah Terry. Fleming Holcombe married Louisa Stone, daughter of Hiram Stone and Ann Long.1 Fleming Holcombe died on 3 August 1865 at Sycamore, DeKalb Co., IL, at age 55. Fleming migrated from New York to Sycamore in 1842. He operated and owned a farm two miles east of the city of Sycamore for nearly 20 years. Both Fleming and Sylvanus farmed on virgin land which was slow, tedious hard work. Fleming was also a shoe maker which helped in the family income. Fleming and Lisa were enumerated in the 1850 Sycamore, Dekalb Co., IL, federal census. He was a farmer, age 40, she was 40. Children in the household were Linus 17, Morris 15, Reuben 13, Mariah 11, Orator 9, and Ellen 5. Fleming and Louisa were enumerated in the 1860 Sycamore, Dekalb Co., IL, federal census. He was a farmer, age 50; she was 49. Children in the household were Reuben 20, Morris 22, Orator 17, and Ellen 14. In 1861 Fleming moved to Sycamore on the south-west corner of High and Walnlut streets. When he died in 1865 his was the first burial in the newly opened Elmwood Cemetery. Seth Holcombe was born on 5 August 1810 at Attica, Wyoming Co., NY. He was the son of Orator H. Holcombe and Hannah Terry. Seth Holcombe married Lucy Ann Winslow in 1834. Went to Canada, where he lived for 30 years. Is this the Seth, age 69, born in NY who was enumerated in Grand Rapids, Kent Co., MI, in the 1880 census? Wife Lucy Ann was 69, born in VT.
Lucy Ann Winslow was born on 1 June 1810 at Woodstock, Windsor Co., VT. She married Seth Holcombe, son of Orator H. Holcombe and Hannah Terry, in 1834. Sophia Holcombe was born in 1812 at Attica, Wyoming Co., NY. She was the daughter of Orator H. Holcombe and Hannah Terry. Sophia Holcombe died on 28 December 1816. Rueben Holcombe was born on 19 July 1815. He was the son of Orator H. Holcombe and Hannah Terry. Rueben Holcombe died on 11 June 1817 at age 1. Mary Holcombe was born on 24 August 1816 at Attica, Wyoming Co., NY. She was the daughter of Orator H. Holcombe and Hannah Terry. Laura Holcombe was born on 22 June 1819 at Attica, Wyoming Co., NY. She was the daughter of Orator H. Holcombe and Hannah Terry. Laura Holcombe married Philander Locke. Philander and Laura were enumerated in the 1850 Machias, Cattaraugus Co., NY, federal census, stamped page 488. He was a farmer age 45 born in MA; she was 31, born in NY. There were no children in the household. There was a boarder, 9 year old Ellen Blackley. They lived next door to Chester Locke and his family. Philander and Laura were enumerated in the 1860 Machias, Cattaraugus Co., NY, federal census, page 265, stamped page 473. He was a farmer, age 55, born in MA, she was 41, born in NY. There were no children in the houehold. There was a border, 20 year old day laborer Amos Dailey. Barton Locke and Chester Locke lived nearby. Philander and Laura were enumerated in the 1870 Machias, Cattaraugus Co., NY, federal census, page 14. He was a farmer age 65, born in MA, she was 51, born in NY. There were no children in the household. There was a boarder, 11 year old Emma Brown, born in NY. They lived next door to Harlin Locke and his family. Philander and Laura were enumerated in the 1880 Machias Village, Cattaraugus Co., NY, federal census, ED 20, Page 23, stamped page 322. He was a farmer age 73, born in MA, she was 60, born in NY. There were no children in the household. Philander Locke was born circa 1805 at MA. He married Laura Holcombe, daughter of Orator H. Holcombe and Hannah Terry. Buelah Hostingting married George F. Holcombe, son of Orator H. Holcombe and Hannah Terry, in 1819. Buelah Hostingting died in 1836. Caroline A. Hibbard was born in 1811. She married George F. Holcombe, son of Orator H. Holcombe and Hannah Terry, in 1837 at Newstead, Erie Co., NY. Caroline A. Hibbard died in September 1852. She was buried at Elmwood Cemetery, Sycamore, DeKalb Co., IL. Reuben Holcombe was the son of George F. Holcombe. Hiram Holcombe was born on 30 October 1838 at Newsted, Erie Co., NY. He was the son of George F. Holcombe and Caroline A. Hibbard. Hiram Holcombe married Clara Benton Dow, daughter of Agrippa Dow and Polly Storrs, on 4 February 1863.3 Hiram Holcombe died on 12 May 1912 at Sycamore, DeKalb Co., IL, at age 73. He was buried at New Sycamore Cemetery, Sycamore, DeKalb Co., IL. Hiram lived on the homestead with brother Orator F; engaged in raising stock and farmed; he specialized in the raising of Berkshire hogs; member of Farmers' Alliance; member of the Agricultural Society (later its President); President of the DeKalb Co., Fair for many years; Democrat, supporting the principles of the Democratic Party as Representative in the Illinois Legislature, 1886-7; for 18 years Road Commissioner of Sycamore Township; President of DeKalb Co. Farmers' Institute; President of Milk Shippers union for farmers contiguous to Chicago; a Universalist--President of the Board of Trustees for several years. Hiram and Clara were enumerated in the 1870 Sycamore, DeKalb Co., IL, federal census. He was a farmer, age 31, she was 26. Children in the household were George D. 5, and Sanford A. 3. Also in the household was the family of brother Orator. Hiram and Clara were enumerated in the 1900 Sycamore, Dekalb Co., IL, federal census. He was a landlord, age 61, she was 56. Only three of Clara's five children were still living. Chldren in the household were Arthur H. 24, and Millie F. 16. [S25] Hannah McPherson, Holcombe Genealogy, Page 129.2/Item A-8-1-2-6-10-1-3. [S451] Robert Piercy Dow, Dow, Page 493. Clara Benton Dow was born in 1844 at NH. She was the daughter of Agrippa Dow and Polly Storrs.1 Clara Benton Dow married Hiram Holcombe, son of George F. Holcombe and Caroline A. Hibbard, on 4 February 1863.2 Clara Benton Dow died in March 1911 at Sycamore, DeKalb Co., IL. She was buried at Elmwood Cemetery, Sycamore, DeKalb Co., IL. [S451] Robert Piercy Dow, Dow, Page 490. Orator F. Holcombe was born on 18 May 1844 at Newstead, Erie Co., NY. He was the son of George F. Holcombe and Caroline A. Hibbard. Orator F. Holcombe married Harriet E. Stowe, daughter of William Henry Stowe and Electa (? ).2 Orator F. Holcombe died on 1 January 1911 at Sycamore, DeKalb Co., IL, at age 66. He was buried at Elmwood Cemetery, Sycamore, DeKalb Co., IL. Orator F. was a partner with his brother Hiram as a farmer and stock raiser on their parents homestead near Sycamore, Dekalb Co., IL. Orator and Harriet E. were enumerated in the 1870 Sycamore, DeKalb Co., IL, federal census. He was a farmer, age 27, she was 25. The only child in the household was Howard H. 8 months. [S25] Hannah McPherson, Holcombe Genealogy, Page 129.2/Item A-8-1-2-6-10-1-4. [S25] Hannah McPherson, Holcombe Genealogy, Page 129.2. Harriet E. Stowe was born on 26 December 1844 at NY. She was the daughter of William Henry Stowe and Electa (?) Harriet E. Stowe married Orator F. Holcombe, son of George F. Holcombe and Caroline A. Hibbard.1 Harriet E. Stowe died on 3 May 1913 at Sycamore, DeKalb Co., IL, at age 68. She was buried at Elmwood Cemetery, Sycamore, DeKalb Co., IL. Howard Henry Holcombe was born on 20 August 1869 at Sycamore Township, IL. He was the son of Orator F. Holcombe and Harriet E. Stowe. Howard Henry Holcombe married Gertrude Etta Helson, daughter of George J. Helson and Cornelia Wyman, on 29 August 1893 at Sycamore, DeKalb Co., IL.1 Howard Henry Holcombe died on 12 March 1916 at Sycamore, DeKalb Co., IL, at age 46.1 He was buried at Elmwood Cemetery, Sycamore, DeKalb Co., IL. George Dow Holcombe was born in 1865. He was the son of Hiram Holcombe and Clara Benton Dow. 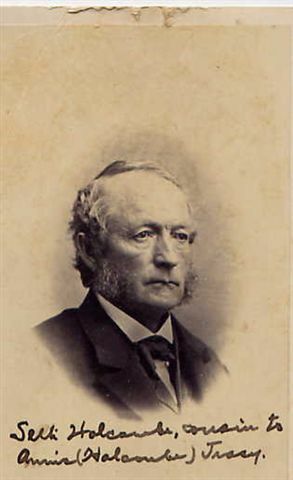 George Dow Holcombe died in September 1885. Frank Terry Holcombe was born in 1871 at Sycamore Township, IL. He was the son of Hiram Holcombe and Clara Benton Dow. Frank Terry Holcombe died in June 1895 at Sycamore, Dekalb Co., IL. Sanford A. Holcombe was born on 11 April 1867 at near Sycamore, IL. He was the son of Hiram Holcombe and Clara Benton Dow. Sanford A. Holcombe was graduated in 1886 at Sycamore High School, Sycamore, IL. He married Clara Varty on 2 December 1891 at Sycamore, DeKalb Co., IL. Sanford A. Holcombe died on 4 April 1940 at Sycamore, DeKalb Co., IL, at age 72. Obtained his early education in country schools; engaged in farming and then entered the lumber business, 1891; formed a partnership, in 1892, with E. B. Shurtleff, lumber and coal business; in 1899, he formed a partnership with his brother, Arthur Hiram, which is still eminently successful; his is President of the Holcomb-Dutton Lumber Co., with branches in Northern Il; a Director in the Pierce Trust and Savings Bank, in the Sycamore B. & D. Association and the Sycamore Chamber of Commerce; active in Civic and Commercial affairs of Sycamore, IL; well known poet and professional entertainer. Sanford and Clara were enumerated in the 1900 Sycamore, Dekalb Co., IL, federal census. He was a lumber and coal dealer, age 33, she was 30. Clara had not given birth to any children. [S25] Hannah McPherson, Holcombe Genealogy, Page 129.2/Item A-8-1-2-6-10-1-3-2. Clara Varty was born in March 1870 at IL.1 She married Sanford A. Holcombe, son of Hiram Holcombe and Clara Benton Dow, on 2 December 1891 at Sycamore, DeKalb Co., IL. Final rites for Arthur Hiram Holcomb, 80, life long resident of Sycamore and a leader in business, civic affairs and in the religioius and social life of the community were accorded thursday afternoon from the Van Natta Funeral Home. Mr. Holcomb passed away shortly after 7 a.m. Tuesday at the Sycamore Municipal Hospital where he had been a patient for four months. Rev. H.L. Michael of the Federated Church officiated and paid tribute to the life of the deceased, who has been devoted to home family and church as well as the community. Many floral tributes evidenced the the high regard in which Mr. Holcomb was held. Interment took place in the Elmwood cemetery. Until a few months ago, Mr. Holcomb remained active in the business that he and his late brother Sanford Holcomb established in 1899, at its present location on DeKalb Ave., known as the Holcomb Brothers Lumber Yard. When Sanford died in 1940, Arthur Holcomb's son, Edward, entered into partnership with him and it became known as Holcomb Yard. Always interested in public affairs beneficial to the welfare of Sycamore, particularly in the matter of good roads, Mr. Holcomb served on many committees of the Chamber of Commerce. he was a member of the road Committee since 1919 and was instrumental in securing the improvement of Route 64 from St. Charles to Sycamore. Born on July 7, 1875 on the Holcomb Homestead farm on the Mount Hunger Road, to Hiram Holcomb and Clara Dowe Holcomb, a prominent pioneer couiple. Mr. Holcomb attended teh Mount Hunger school and was graduated from the Sycamore High School, later attending the University of Illinois. On october 24, 1900 he was marrried to Clara Ann Boynton in Sycamore. Her death occurred in 1945. he later married mary glidden Renwick on July 19, 1952. Mr Holcomb was a devoted member of the Universalist Church, which in 1928united with teh Congregational Church to become the Federated Church. He was treasurer of the Universalist Church for many years, began ushering there in 1898, and later served as president of the Board of Trustees, and when the two churches federated, he was re-elected treasurer serving in that capacity for 16 years as well as continuing his ushering duties. In Julyof 1955 he was made usher emeritus of the Federated Church. he was also a member of the Elks Lodge. Mr. Holcomb loved travel and consistently took a vacation every year for fifty years, visiting many varied places of interest. Mr Holcomb was a charter member of the Kishwaukee Country Club in 1910 and continued as a member for 33 years, being a member of the board for 31 years of that time. An outstanding event in his life was the 50th anniversary celebration of his 50 years in business at the same location as well as under the same family ownership. The banquet at which some 200 were present to honor him was at the Federated Church. Mr. Holcomb is survived by his wife, Mary, one son, Edward, one daughter, Mrs. Clinton (Helen) Jones of Elmhurst and three grandchildren, John robert and Jenny Holcomb. Preceding him in death were his parents, three brothers, George, Frank and Sanford Holcomb and a sister, Mrs. Mildred Resch. Clara is active in church work as President of the Ladies Aid Society; in civic work, as President of Sycamore Women's Club (2 years), and is Regent of the John Stark Chapter of the D.A.R. Clara Ann Boynton was born in 1874 at Sycamore, DeKalb Co., IL. She was the daughter of Edward Boynton and Ida De Ette Paine. Clara Ann Boynton married Arthur Hiram Holcombe, son of Hiram Holcombe and Clara Benton Dow, on 24 October 1900 at Sycamore, DeKalb Co., IL. Clara Ann Boynton died at Sycamore, DeKalb Co., IL. She was buried on 9 November 1945 at Elmwood Cemetery, Sycamore, DeKalb Co., IL. [S104] DAR DAR Lineage book, Vol. 107/Item 106801. Helen May Holcombe was born on 12 February 1904 at Sycamore, DeKalb Co., IL. She was the daughter of Arthur Hiram Holcombe and Clara Ann Boynton. Helen May Holcombe was graduated in 1922 at Sycamore High School, Sycamore, IL. She died in 1974. [S25] Hannah McPherson, Holcombe Genealogy, Page 129.2/Item A-8-1-2-6-10-1-3-3-1. Mildred Florence Holcombe was born on 11 July 1883 at Sycamore Township, IL. She was the daughter of Hiram Holcombe and Clara Benton Dow. Mildred Florence Holcombe married Alvin Herman Resch. Mildred Florence Holcombe died in 1953 at Sycamore, DeKalb Co., IL. [S25] Hannah McPherson, Holcombe Genealogy, Page 129.2/Item A-8-1-2-6-10-1-3-5. Alvin is in the printing business, half owner of the True Republican. Alvin Herman Resch married Mildred Florence Holcombe, daughter of Hiram Holcombe and Clara Benton Dow. Morris Holcombe was born in 1838 at Attica, Wyoming Co., NY. He was the son of Fleming Holcombe and Louisa Stone. Morris Holcombe married Mary Harrington. Morris Holcombe died at Fargo, Cass Co., ND. One-time sheriff of Dekalb Co., IL; lived to a very old age at Fargo, ND. Morris and Mary were enumerated in the 1870 Sycamore, DeKalb Co., IL, federal census. He was a farmer, age 32, she was 24. The only child in the household was Carrie, 3. Also in the household was mother Louisa 60, and brother Orator 26, and his wife Ellen. Reuben J. Holcombe was born on 27 September 1839 at Machias, Cattaraugus Co., NY. He was the son of Fleming Holcombe and Louisa Stone. Reuben J. Holcombe married Corrinna E. Boardman, daughter of Daniel Boardman and Tryphena Mason, on 27 August 1862 at Sycamore, DeKalb Co., IL. Reuben J. Holcombe died on 24 October 1921 at Sycamore, DeKalb Co., IL, at age 82. He was buried at Elmwood Cemetery, Sycamore, DeKalb Co., IL. Came to DeKalb Co., IL, with his parents, 1842. At the time of their arrival there were but 6 or 7 houses in Sycamore; he obtained a common-school education; enlisted 8-27-1862, when the Civil War broke out, serving in the 105th Ill. Vol. Inf., Co., A; served as Deputy Sheriff of DeKalb Co., Ill, until 1872 when he was elected Sheriff; re-elected, 1874-5-8, later being Deputy-Sheriff (31 years as Sheriff or Deputy); his ability as a detective recognized over a large part of the state. Reuben and Cora were enumerated in the 1870 Sycamore, DeKalb Co., IL, federal census. He was a constable, age 30, she was 29. The only child in the household was Jessie M. 9 months. Reuben was enumerated in the 1900 Sycamore, DeKalb Co., IL, federal census. He was a constable, age 60. He was a lodger in a hotel. [S23] Jesse Seaver, The Holcomb(e) Genealogy, Page 93. Orator S. Holcombe was born on 11 August 1842 at Sycamore Township, IL. He was the son of Fleming Holcombe and Louisa Stone. Orator S. Holcombe married Ella Martha Hubbard, daughter of Nelson Hubbard, on 22 January 1872 at Sycamore, DeKalb Co., IL. Orator S. Holcombe married Ida Hubbard, daughter of Nelson Hubbard, on 4 October 1916. Orator S. Holcombe died on 19 November 1919 at Sycamore, DeKalb Co., IL, at age 77. Served in the Civil War as a private in Company F, 132 Illinois Infantry. Repuiblican; Sheriff of Dekalb Co and Deputy Sheriff for many years; Universalist; Mason. Orator and Ella M. were enumerated in the 1900 Sycamore, DeKalb Co., IL, federal census. He was 56, she was 55. Also in the household were (sisters-in-law?) Lucina 60, and Ida 49. Ellen Holcombe was born circa 1843 at IL.1 She was the daughter of Fleming Holcombe and Louisa Stone. Corrinna E. Boardman was born in 1839 at Dundee, Kane Co., IL. She was the daughter of Daniel Boardman and Tryphena Mason. Corrinna E. Boardman married Reuben J. Holcombe, son of Fleming Holcombe and Louisa Stone, on 27 August 1862 at Sycamore, DeKalb Co., IL. Corrinna E. Boardman died on 4 April 1894 at Sycamore, DeKalb Co., IL. She was buried at Elmwood Cemetery, Sycamore, DeKalb Co., IL. Minerva E. Holcombe was born on 15 August 1871 at Sycamore, DeKalb Co., IL. She was the daughter of Reuben J. Holcombe and Corrinna E. Boardman. Minerva E. Holcombe died in 1944 at Sycamore, DeKalb Co., IL. Ella Martha Hubbard was born in 1846 at Windsor, VT. She was the daughter of Nelson Hubbard. Ella Martha Hubbard married Orator S. Holcombe, son of Fleming Holcombe and Louisa Stone, on 22 January 1872 at Sycamore, DeKalb Co., IL. Ella Martha Hubbard died on 5 December 1913 at Sycamore, DeKalb Co., IL. Ida Hubbard was born in May 1851 at VT.1 She was the daughter of Nelson Hubbard. Ida Hubbard married Orator S. Holcombe, son of Fleming Holcombe and Louisa Stone, on 4 October 1916.